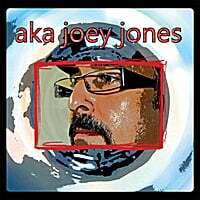 aka joey jones | aka joey jones Official Site | Blog : What's in a Name? I've used joey jones as a tongue-in-cheek pseudonym, a nom de guerre, if you will, for performances, on and off over the past twenty years. I'm not really sure why. I mean, I like the way it sounds. It has a touch of rock 'n' roll panache, Jones being a quintessentially rock 'n' roll name--Brian Jones, Mick Jones, John Paul Jones, Steve Jones, Howard Jones, David Jones, Tom Jones, George Jones . . . well maybe not so much the last two--but that's not it. I like that it borders on the trite and pretentious, and as such, is meant with a certain irony and humility, reflected in the lack of upper case letters and embellishments of proper nouns. But that isn't it either. Let's just say, it is my humour. I did not intend to use the name for this project. It didn't seem to fit. But, then I chanced upon the aka putting together a press kit for Mass Conception. Joe Cappadocia (aka joey jones). Perfect, also known as! I was reading Haruki Murakami's 1Q84 and was fascinated by the idea of parallel worlds. That's what this project seemed for me, a parallel world, a world almost the same, but not quite, slightly different, a world in which joey jones come to life as a bona fide artist, kind of, as an aka. aka joey jones, also, I think, picks up on the alternative aspect of my work. It becomes a counterpoint to the idiom, "keeping up with the Joneses," a comment on rampant materialism and excessive consumerism of pop music. I said the name bordered on the pretentious! More the point, it is reminiscent of my influences, especially The Smiths and The Cure.